Vehicle Wraps and Screen Printing by Fast-Trac Designs & Phx Screen Printing: Protect Your Investment! A goal of every company is to grow, right? Fast-Trac Designs is very excited to introduce another division of our company called Wrap Detail LLC. We provide hundreds of clients whom are also business owners with vehicle wraps and we will also now provide care and protection for the wraps. Wrap Detail LLC currently has three products available that were specially created by Fast-Trac Designs to keep your vehicle wrap clean as well as protect it from the elements we drive through daily. The first is Finishing Touch spray that is to be used after washing while the surface of the vehicle is still wet. a few sprays will eliminate water spots & remove any remaining residue. Finishing Touch can also be used on any surface including windows, chrome, paint and certainly on vehicle wraps. wrap looking new and only needs to be used every 3 months. This wax also features rain dance technology that repels water drops to keep your wrap spot free. The final product is another wax called Water Craft Wax. This is great for boat wraps and keeps your boat looking new! 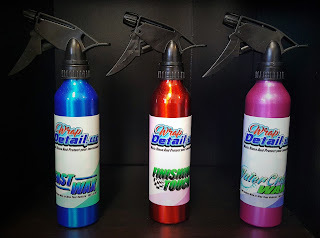 Only supplied and sold by Fast-Trac Designs these items can be purchased for $20.00 each or $35.00 for both the Finishing touch and Fast Wax. We will also refill your bottles at our shop for $15.00 each. Wash, Rinse and Protect your investment with Wrap Detail!